Legend has it that Mick Jagger first drank a Tequila Sunrise on the West Coast leg of the Rolling Stones' 1972 North American Tour while attending a private party at The Trident in Sausalito, CA. Jagger loved the mix of tequila, orange juice and grenadine so much, that from then on, he and his entourage ordered the cocktail everywhere they traveled across the country, thus becoming the tour's unofficial beverage. With that endorsement (and with a little help from Eagles) the drink took off. By 1973, Jose Cuervo was putting a Tequila Sunrise recipe on the back of their bottles, and the rest is mixology history. 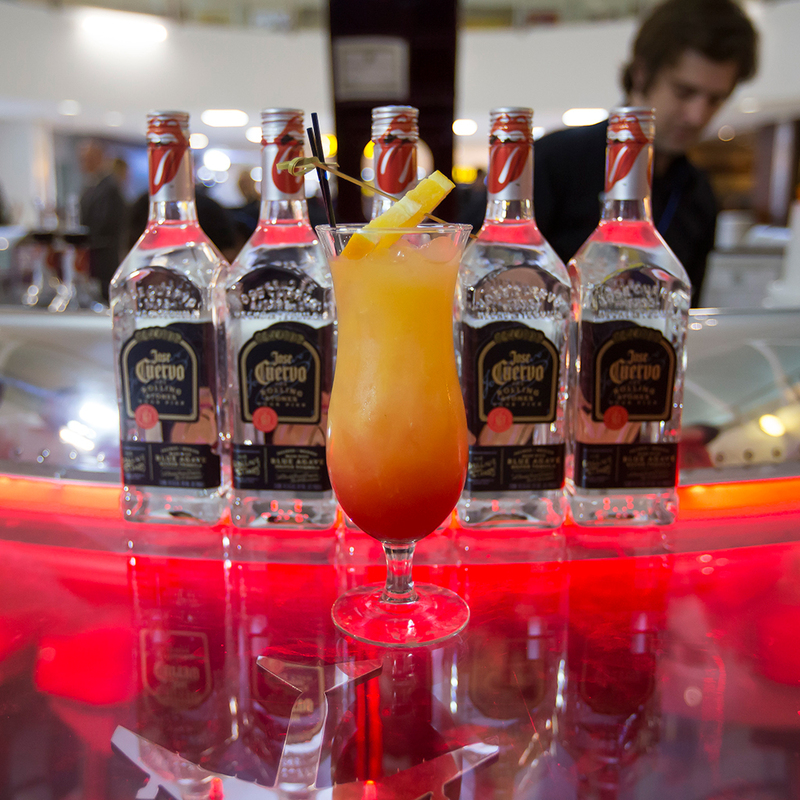 To commemorate the influence that tour had in popularizing the Tequila Sunrise, Jose Cuervo has teamed with Air Hollywood, the leading designer of airplane sets (including Bridesmaids), to build a unique, pop-up experience in the middle of JFK Airport's Terminal 4. FWx was invited to the launch, to sipped cocktails, see a bit of Stones history and play a couple rounds of Guitar Hero. On hand was legendary rock 'n' roll publicist Carol Klenfner (Elton John, The Who, Joe Cocker), who travelled with the Stones on the East Coast leg of the tour. At that point the decade old band was hugely popular, and the well-documented issues with the Hell's Angels running security on the previous tour meant safety and privacy needed to be stepped up. This including taking over entire floors of hotels and renting the band their own plane, the tail of which was decked out in the famous tongue logo. Klenfner referred to the whole band and crew, also known as the STP (Stones Touring Party) as "a pirate nation on the move." The Rolling Stones Tour Plane Experience will be serving up Cuervo Especial tastings (2:30 p.m. to 8:00 p.m., Mondays-Saturdays) and offering fans the opportunity to buy limited edition Rolling Stones Tour Pick bottles from now until December 30th. Much like getting on the Stones' actual plane back in the '70s, you'll have to pass through security to board. Luckily any holiday traveller with a plane ticket can consider themselves a VIP.